Microsoft Pro Photo Tools provides a set of photography tools for photographers such as to view, add, change, edit and delete common metadata properties for digital photos or pictures, and captures RAW images. It also includes ability to geotag the photos, including latitude, longitude, and other location details. With the help of Microsoft Virtual Earth and Live Search Maps service (previously Windows Live Maps and Windows Live Local), user can place photos on the Live Earth map and then drag them to the right location to automatically tag GPS information into the photos, or load track route files recorded with GPS tracker device in most popular format (NMEA, GPX and KML). 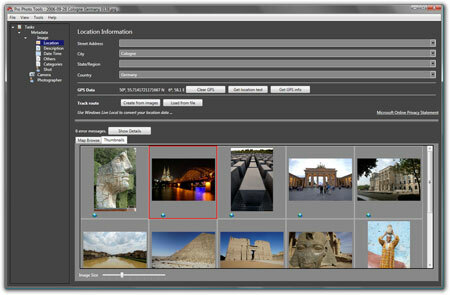 Pro Photo Tools works in English locale of Windows Vista and Windows XP (requires .NET Framework 3). Update: Pro Photo Tools has been discontinued by Microsoft.